Our Welcome Parties are the official start of the greatest 2 weeks of your life and the best introduction possible for your uni years. 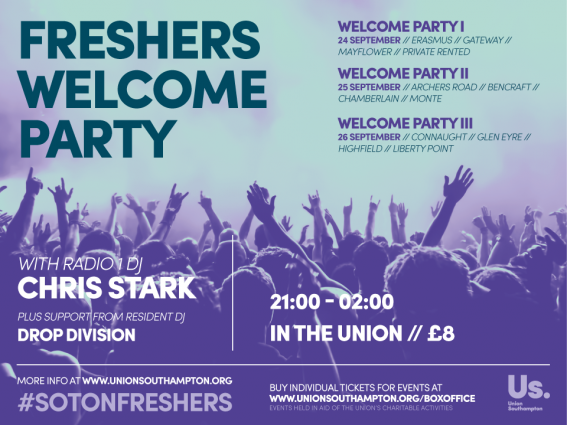 BBC Radio 1 DJ and Southampton alumnus, Chris Stark, our (almost) resident DJ, comes back every year for this event, so it must be quite something! Wear your t-shirt with pride, come down to The Cube (Union Southampton Building – 42) and enjoy the first of the many great nights you will have here! It’s free entry to our Master Pass holders, otherwise you can buy your ticket at the Box Office (Reception, Building 42) or on the Box office website at www.unionsouthampton.org/boxoffice. Buy early to avoid disappointment, because once they’re gone, they’re gone!